Wow, well, as a newcomer to the site I gotta say this thread was an amazing read, exciting and extremely educational - well done all, some impressive analysis and insight! What luck this guy had in having this bucket and pieces cross his path! Once-in-a-lifetime. I'm looking at the vertical line on the cheek, and I'm wondering if it's the vertical pole that's holding up the lighting diffuser. When the owner came to me with this helmet and costume I specifically came here to ask members their opinions - since I have great respect for the depth of Vader knowledge that exists here. Will we see some more pics of this great suit Jez? I'm trying to sort out a review video - and convince the owner to let me progress. Glad to hear it. Gino is right at times. More right than wrong for that matter but simply put, some here have these cast off originals in hand and far less altered to make better assessments instead of over fabricating details and making judgements based on wishful thinking. 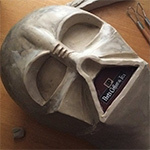 He doesn't do it all the time but with some things which spring to mind like Vader domes for one and while they have a link they are not true pieces to the screen used in the final look and finish. This is evident to anyone who knows about these things as well as him upgrading parts over the years and sticking to the same story. Most things DO need modification but the good stuff that doesn't have heavy recast traits is far more subtle and looks more or less dead on with little to do. Another aspect I believe is to be a true expert you draw resources from all areas and colaborate with others if you can. For argument sake if there is a detail you look into, six people looking into that area who have a good eye for detail is stronger than one and you come to a conclusion based on evidence submitted. That is my personal opinion and not referring to the above person. Paul won't refer to the above person. I will! After having been in the hobby for the last few years, I've come to realize that a great deal about the hobby has to do with powers of observation and memory of the details. A prop's back-story may or may not be verifiable, so you examine screen shots, production photos and any visual material and compare them against the real life object at hand. (I say "memory of the details" because you can get so myopic you lose sensitivity towards another feature. You sometimes have to take a step back and refresh your view of the whole prop). Gino has good powers of observation. As much as he bullies people on how accurate he is, there are some blatant errors that show myopia that any fan can be vulnerable to. The irony is that I don't consider his Vader to be the "cast off untainted originals" and having the nearly stepped-off-the-screen look as he believes, and yet he has one of the absolute best and most life-like Yodas in the world. If you can abstract someone like Gino from all this "provenance" and "secret LFL sources" you have someone whose artistic eye can truly take him places. Since the Yoda he uses was a fan sculpt, the laurels of setting up a 1:1 scale display is solely based on a fan's powers of observation and patience. Were the values of the community reassessed along these lines, Gino would undoubtedly be a hero rather than having to stand in the limelight of half-truths, implications, bullying and deceit. Instead of trying so hard to play King of the Hill, he would have - in my eyes - been a hero. We therefore need a greater spirit of cooperation. Paul will catch things Carsten misses. Carsten will catch things that I miss. And so on. When we combine our observations, we have a collectively improved understanding of a prop. Gino never said it was secret. But I dont know why people will keep insisting that he has "secret LFL sources"? I have never ever seen or heard him make this claim. I may be wrong. And anyway we all have info we cant share what it is or where we got it. I have several stormtrooper helmet pictures I really want to post to help prove my point over in the stormtrooper thread. How do you watermark a photo by accident ? And not only did he not watermark it by accident(that's so funny) he ignored Tom when asked about it. In regard to Gino's comments about Jez, if he was really so capable of assessing what that Vader suit was, then he would have to have superior reference material. If he had superior reference material, don't you think he would show it off? Duuhhh! That's all he would do. So? That tour suit Vader helmet blows Gino's ANH Vader helmet out of the water even in the condition it is in.....so what exactly was he going to use for reference to determine the authenticity of the tour suit Vader helmet? His own? Not starting a fight Mac but everybody has that picture. I bet all the members of TDH have it. Just because everyone supposedly has it (I didn't), it doesn't mean it's right to steal and stamp your name on it and to present it to the world like you were the image's originator. That image was photographed by Tom and given to a select few people. Gino finally obtaining it and posting it as if it was proprietary to his website is sad, just sad. What kind of moral values are you defending here, Midnight? Following someone because he helped you is a good thing. But blindly following someone for such repugnant behavior and then maligning those who oppose poor behavior... that's something I just can't fathom. I wish Gino trained his fans better, as having a better eye for Vader-related props would help them see what we've been seeing all along rather than regurgitate things along the lines of how everyone else is "jealous" of him, or have "personal issues" or "don't believe a thing they say today because they believed Ainsworth yesterday". I have never had one of Gino's following properly debate prop observations. They always attack the person, distract the issue, evade direct questions on the prop, and never truly see what everyone else sees. Ask a valid question on RPF and they behave like attack dogs, drowning out reason with ridicule. Enough said. I'll take that MP tour ANH helmet any day over Gino's. If the man who sculpted Vader 30 years ago didn't think well enough of Gino's display to feature it on the cover of his autobiography, I think that should tell you that the man who sculpted Vader may have a better eye of his own creation than you or I do. Mac I really think that picture was on TDH Boba Fett reference CD's. I respect where it came from but honestly I didnt know or care prior to me learning the story from Tom. I have had it shared to me a few times besides having it on CD so its really not rare anymore. And yeah, Gino watermarked it just like every other picture he posts. I am sure he never even thinks about it. Surely its not the first time this has happened. I can think of some others. But its really hard for me to believe it was malicious. What possible reason for doing it can you come up with when he knew full well that everyone had the picture? Again I dont really approve of the way he handled it but it is what it is and not what you think it is. Why dont you look at my arguments for once? I do see what everyone else sees but quite often , I disagree with what they see or the predetermined logic through which they see it. I have tried pointing out different logic and plausibilities with Vader and troopers and get nowhere. Even when comparisons are flawed and I say so it gets me no where. Remember when you compared Gino's trooper helmet back and cap to the Dave M. and didnt understand that several original helmets look different in that area due to the vacforming? I remember. So when the same person wants to compare Vader helmets I am a bit wary but I give benefit of doubt. When I see a doubtful compare being used to prove facts however... Then I have to speak up so that these "facts" arent set in stone prematurely. Maybe I should just go back to saying nothing? I dont seem to be getting through. Once you get of the Gino topic and start back in to props we have nothing to talk about. I certainly dont want to hash it all out again. Let's keep the focus on the props and not the people yammering about them. I'm sure all can find some dirt in my prop past that can be used to invalidate my person in any conversation, when trying to make my observations. Is that really the prop community we want, where everything is held against you, even if you are right and have a point? Personally... enough with GINO. He's not here, so why should we bother talking so much about him? He's not the end all, be all of all things Star Wars... and he's not a prop - neither is anyone else. So focus people... focus on the prop!